In this chapter, we will study and analyze instruments used for raising capital that do not fit neatly into the debt and share equity categories. Equity was a residual interest in net assets with rights only to dividends as declared and no guaranteed return of capital. Income bonds are bonds that pay interest, but only when the corporation has earned a certain amount of income, or operating cash flow in the year. The interest flow is contingent on performance, and doesn’t really meet the liability definition. In this category, a corporation has to be bought back for cash, they are more like a liability. The convertible debt, convertible at the investor’s option, presents another accounting dilemma. The issuing company allows the investor to convert the principal portion of the bond into a certain number of common shares on certain dates. The issuing company usually hopes that the bond will be converted prior to maturity, but cannot force conversion. Investors will convert only if the shares are worth more money. So, may be the company will avoid having to repay principal, if share price increase, but may be they’ll have to repay the debt, if share prices are soft. This is a contingency, and obviously hard to place into debt-or-equity slots. 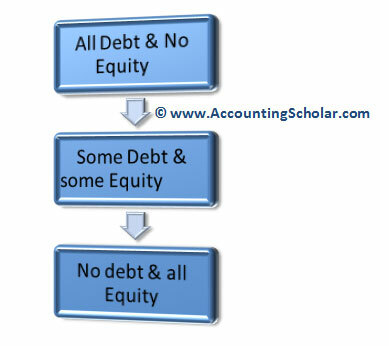 This diagram above shows that corporations can finance their activities by raising debt (such as issuing bonds payable) or by issuing common shares (equity) or do a little bit of both. Corporations (and the capital markets) have been very inventive in designing not only new types of derivative instruments, but also new types of primary securities that have characteristics of both debt and equity. These new types of securities are called ‘hybrid securities or investment vehicles’. The old method of classifying debt and equity on the balance sheet doesn’t work very well when the formerly clear boundary between debt and equity is bridged by hybrid securities. Corporations issue certain types of securities that are neither debt nor equity in themselves, but that represent the right to acquire securities (usually common shares) at a pre-determined price in the future. A stock right is a form of stock option, which in turn is one category of a broader classifications known as derivative instruments. By themselves, stock rights represent neither an obligation of the corporation nor a share interest in the corporation; their value is derived from the value of the underlying security that can be acquired by exercising rights.